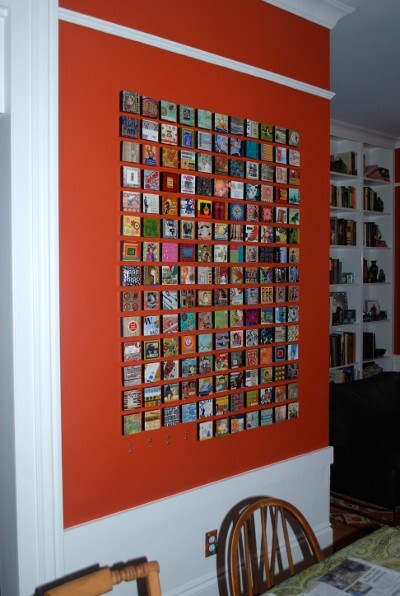 We receive many emails about hanging artwork with neodymium magnets. Magnets are no longer only for hanging kid's art on the refrigerator -- many artists are using neodymium magnets to mount artwork in galleries and museums. Though it's hard to judge art, this month's winner is Jill S. from San Francisco, CA with a great idea for an art project using magnets. This giant collage is located in my home and was made entirely by my kids and I over the course of a year and a half. It is designed to keep growing and will eventually fill up the entire wall. As shown, there are currently 165 blocks, all secured with neodymium magnets. I used 7/16” diameter x 1/16” thick D71-N52 neodymium magnets and the smaller 1/4” diameter D41 magnets to secure the wood blocks to my wall. First, I laid out a grid on my wall, and then glued steel washers directly to the wall. The magnets are glued to the back of each wood block at the center point (for the larger magnet) and an inch below (for the smaller magnet). I wanted to be able to change the piece and move the blocks to different spots. In order to maintain the tight grid pattern, I applied the second magnet to each block below the center point. Before I did this, the blocks needed constant adjustment when they were moved and were slightly crooked. But with the second magnet, they align perfectly and stay in place without spinning! Each 3” x 3” wood block is a unique piece constructed using a wide variety of materials such as found objects, paint, paper, metal, and other collage materials. I think of it as a non-traditional scrapbook. Some blocks contain drawings my kids made that I saved, some are favorite photographs, others are a canvas for experimenting with new techniques. There are objects on the blocks that we saved that would otherwise be in a box on a shelf somewhere. All edges are painted black. The blocks are then finished with many coats of lacquer to create a smooth glossy finish. Thanks for making such a great product! I was thrilled to find the perfect solution for displaying my project! A D71-N52 and D41 magnet is glued to the backside of each block. 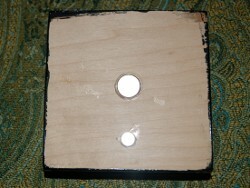 In the description above, a pair of magnets were glued to the block that attracted to steel washers on the wall. This is a great method, which obviously led to a great end result. Another popular solution is to use magnet-to-magnet attraction, gluing or screwing magnets to the wall. Our Countersunk Magnets are often used in this way. 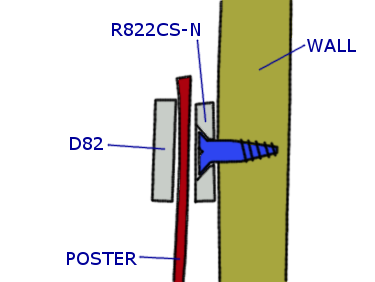 For example, you might screw a 3/8" diameter R622CS-N or a 1/2" diameter R822CS-N to the wall. Then, you would use a disc with the same diameter on top of the artwork, like a D62 or D82. 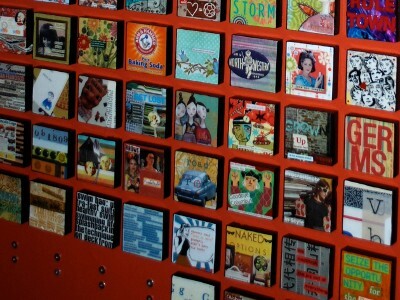 Thin artwork like poster or cardstock is sandwiched between the magnets. This method is often used to secure poster-sized art to a blank wall. It's great for when you don't want to mark or cut the poster at all. Larger countersunk sizes are available too, such as the 3/4" diameter RC22CS-N, and the big 1" diameter RX033CS-N.
For advice on what adhesives to use with magnets, see our article: Sticky Business – How to Glue Neodymium Magnets.